When Gypsy Willis received a text from her married lover that said he'd just lost his wife, she had no idea what it meant. "I didn't have any idea what he was talking about," she says. "I joked back, asking if she had gone for a walk or something. I felt terrible and was in utter shock when he told me she had died." Willis also had no idea that she'd find herself the subject of worldwide media attention—profiled on Honduran TV, chronicled in London's Daily Mail and featured on ABC's 20/20—or that her lover, Dr. Martin MacNeill, would be accused and later convicted of murdering his wife. MacNeill's wife, 50-year-old Michele, was found dead in the bathtub of her Pleasant Grove home April 11, 2007. Pleasant Grove police and an autopsy initially ruled that the death was accidental, but Martin's daughters and Michele's sisters were convinced that MacNeill had killed his wife. MacNeill had encouraged Michele to have a facelift, and had asked her plastic surgeon to prescribe stronger drugs than usual, according to testimony at the subsequent murder trial. Daughter Alexis MacNeill testified that her mother was unusually lethargic and unwell after the surgery, and that she told her daughter, "If anything happens to me, make sure it wasn't your dad." The next morning, her mother was dead. The two oldest daughters became driving forces in the case against MacNeill. Both they and prosecutors stated that MacNeill killed his wife to pursue a full-time relationship—and marriage—with Willis. Willis, 37, is articulate and reflective. 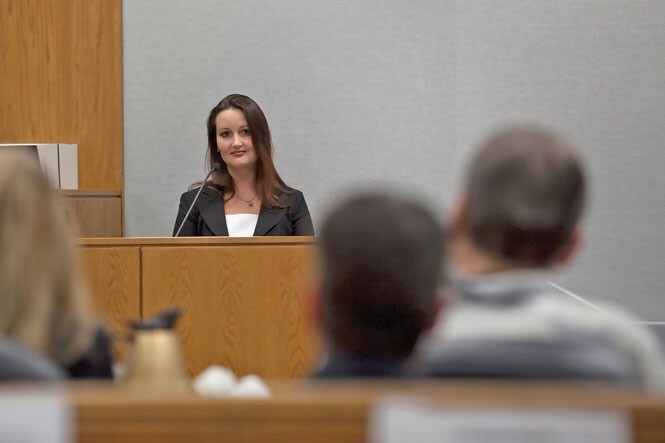 Her self-assurance was on full display during her testimony in the 2013 MacNeill trial, which was the first Utah trial to be televised and became a national sensation thanks to the tabloid-ready combination of a mistress and Mormonism. On the stand, Willis calmly responded to questions regarding phone and text contact with MacNeill around the time of Michele's death, and described their relationship, including how she became the nanny for his children after his wife's death and his marriage proposal. She also read excerpts from letters she and MacNeill exchanged while both were in prison on identity-theft charges. She says she's glad no one could tell how scared she was while testifying in the murder trial: "I felt like a hummingbird on the inside." Long before she ever crossed paths with Martin MacNeill, Willis' struggles against her conservative Mormon family's values led to her own share of sorrow. Her quest for a successful adult relationship included recovering from a failed marriage, and having access to her child curtailed following bitter conflict with her parents. While her relationship with the charming doctor offered excitement, their lives were both shattered when he was charged with murder. Gypsy Willis looks at defendant Martin MacNeill as she testifies about their relationship during an October 2012 preliminary hearing. In October 2012, Willis and MacNeill, then 56, were both in court for a preliminary hearing. It was the first time Willis had seen him since January 2009, she says. Although he looked much older and thinner, she says, "I would look at him and remember our life together. I don't think anyone could do that and not feel something. Most of it is just sorrow that it didn't work, that people were hurt, that we were in these circumstances. But I loved Martin, and I don't think that was a bad thing." Willis was born in St. Anthony, Idaho, in 1976. She was a dark-haired, dark-eyed baby who got her name after her mother put a red cap on her and remarked that she looked like a gypsy. "That should be her name," her father said. She came from a conservative Mormon family "that is a little bit on the fringy side," she says. "While the Mormon church does encourage preparation, my dad had The Anarchist Cookbook and sold guns to add to our income when he was in medical school." The family lived in Pocatello, Idaho, until Willis was 13, when they moved to a town 30 miles from Des Moines, Iowa, where she lived during high school. She became a licensed nurse when she was 18, but wanted to be a doctor. "I thought I would use this skill to pay my way through medical school," she says. In 1995, at 19, she was working as a nurse and going to college when she became pregnant. Her family, she says, "freaked out and acted like we were in another century, saying, 'Look at the horrible example you've set.' "
She decided to keep the baby—a daughter, later named Heidi Marie. The father, an engineering student, was living out of state, but told her they would get married. But when her daughter was born, "I was having her in the hospital by myself. When I did reach him, I got his fiancee. He had moved on." Later, she was married for about two years to a man whom she put through school while he studied to become a chef. But, she says, he became verbally and then physically abusive. She returned to live with her family in Idaho, where she worked as a nurse, attended college and began dating a man her family initially thought was wonderful. The wages in Pocatello were too low, she says, so she decided to move to Salt Lake City. Her family, she says, pressured her to let Heidi remain with them during the workweek. She agreed to a temporary custodial care agreement that granted her parents rights over practical matters such as Heidi's schooling and any necessary hospital visits, then eventually agreed to a full adoption. But tensions soon grew over the arrangement with her parents. They changed their minds about her boyfriend, she says. She told them she wouldn't bring him to their house, but was going to love whomever she wanted. "At that point, they said, 'Don't come back here,' " she says. In 1999, she sued her parents to try to get custody of Heidi. In a mental-health assessment, counselor Karen Anderson of Pocatello, Idaho, stated that Willis was forced into relinquishing control of her daughter. "Gypsy was mentally and physically abused and ultimately signed adoption papers while in a state of duress and threat," Anderson wrote in her report. Willis eventually dropped her custody battle. "I pushed the ends of my finances as much as I could until she was about 5 1/2, then thought that it might be too traumatizing to take her away," she says. While she wasn't able to see her daughter, she stayed in contact with her paternal grandmother. Through that contact, Willis learned that her brother was blessing his baby at a church in Bountiful. She decided to try to see Heidi. "I thought my parents might not have too much of a tantrum because we were in church." Willis arrived a bit late and sat down next to Heidi and her father. Her mother patted her shoulder. "It was great," Willis says. "I was invited to a little picnic afterward." Over the next few years, Willis tried to approach her parents as an adult would other adults. "We slowly developed contact, which opened my heart up to being hurt more later." Willis met Martin MacNeill online in 2005. Back then, Yahoo had a service called Yahoo Members. "It wasn't a dating site," Willis says. "You created a post of who you were. When people with similar interests saw that, they would chat with you." MacNeill, she says, jokingly accused her of trying to be smarter than she was when she posted, "What do you know about quantum physics?" Their casual conversations had a spark, although he alluded to being in a relationship "of some kind." They instant-messaged back and forth for about three weeks before meeting in person. The trial and prison life have left the present-day MacNeill looking so old and thin, she says, that he scarcely resembles the handsome, self-confident man she met in November 2005 for lunch at a Thanksgiving Point restaurant. He wore a nice overcoat and a scarf over slacks and a shirt. She was initially attracted to his smile and tone of voice, as well as his intelligence, which she already knew about from their online conversations. "What are you doing with me?" she wondered afterward. MacNeill seemed reserved during the lunch. "He let me talk more about myself than he talked." She told him she worked as a nurse; he told her he was a doctor, was married and had a great life. "That's kind of too bad," she says she thought. After the lunch, they stayed in touch; instant messaging progressed to texting, their relationship eventually shifting from lunch dates to lovers around January 2006, she says. MacNeill told Willis that he sought extramarital excitement, she says, "and that is what I was. It was very passionate and very sexual. It was so fun—this beautiful, handsome doctor taking time out of his life for me." She recalls going with him to a building in American Fork that was scheduled to be demolished for what she calls a "rendezvous," only for someone to walk in on their tryst. "I had my coat and threw it on. I was shaken, but it was exciting." When they weren't tempting discovery, he would visit her in her apartment or she would meet him at a motel in Orem. "It was the fun, passion and excitement that he liked," she says. "He had a lot of demands in his life—church stuff, a large family, daughters in dance, and he and his wife being social figures. ... I was the only aspect of his life that didn't drain him. But, she says, the lines between his two lives were clearly drawn. "He had a perfect life and an image he was maintaining. I had my own life and was supporting myself. I had hobbies, friends and interests and went places." Willis says she loved MacNeill, describing him as "the American version of Prince Charming, coming from his glorious castle." She appreciated his dry wit and spontaneity. "I tend to fall for charismatic, insincere people, but he seemed sincere." She says she was dating other people, and she's sure she wasn't his only extramarital relationship. Such behavior seems at odds with media descriptions of MacNeill as a "former Mormon bishop" or "former Mormon Sunday school teacher," but, Willis says, MacNeill was successful at compartmentalizing his life. "He felt his Mormon faith was very important to the structure and social support of his family," she says. "When he was there, he sincerely felt the spirit and participated gladly." But it was separate from his employment, intellectual pursuits and, obviously, the time he spent with women. "I know he felt liberated in my presence, as I did not ask, expect, or judge anything about him," she says.